AAA Northeast is a membership organization servicing over 5.2 million members across 5 states from Rhode Island to New Jersey. World class roadside assistance is available 24 hours a day, as well as insurance, travel and financial services through a half dozen call centers and more than 60 branch locations. 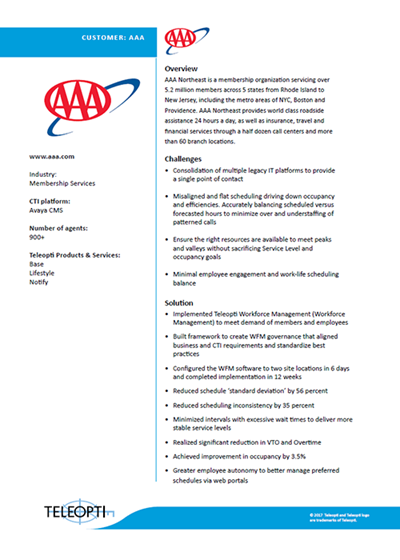 Read this one-page snapshot of how AAA boosted employee engagement whilst meeting the needs of members with Teleopti WFM.